With FA the tendons become short pulling the feet into funny position. In March 2016 I had corrective surgery . I saw the surgeon a few days before and he explained that my surgery will comprise of two parts: releasing muscle around my ankle which will correct the inward turning of my feet and releasing the tendon to correct the fact that my toes point towards the floor. 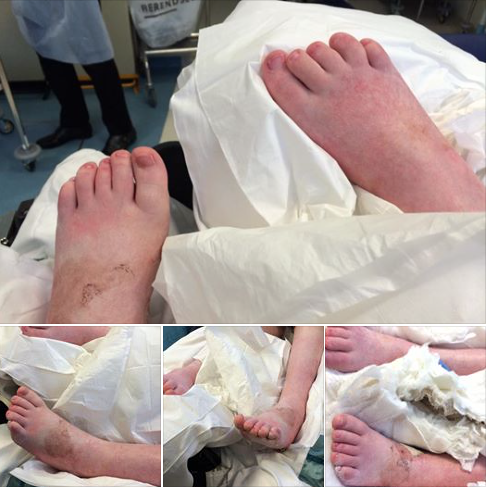 He warned that there was a risk of tearing the skin which could lead to infection which could lead to amputation. I didn't expect to hear this at all and it did really worry me. I shared my worries on Facebook and everyone was so supportive and encouraging, reassuring me that they have to warn you about what might happen in the worst case scenario as they have to cover themselves. At the end of the day I couldn't not have the surgery and just have left my feet to progress further so I decided to carry on with the surgery regardless. 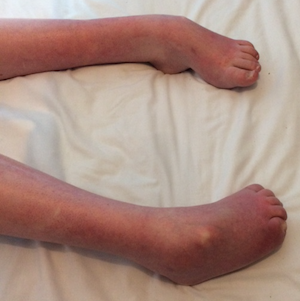 I had wanted this surgery for about 10 years - I remember asking a consultant about it when my feet first started to turn (it was actually on holiday in Cyprus in 2007). He said then that my feet weren't bad enough to warrant the surgery and put me on the waiting list for Botox which was successful until I became immune to it about 4 years later. I can't tell you how much I wish they had of just given me the surgery in 2007. I also suffered with very painful sores on the soles of my feet where my mishapen feet would rub on my shoes and pressure would build - District Nurses were coming out to check these sores every week. Also because my feet pulled my legs into funny positions I would sit really awkwardly in my chair. So the day came and although the surgery took 5 hours when it was scheduled to last 3, all went well. I was thrilled to be able to sit up afterwards and see my toes! For years my toes curled inwards and my feet have pointed downwards - flat against the bed. I left the hospital the day after; I had both legs in casts but as I used a hoist before I went in anyway I already had all the equipment I needed at home. Over the next few weeks I had a fair few aches and pains. I took co-codomol whereas I'm not used to taking anything stronger than paracetamol so I was very tired. I found massage on my knees and thighs and applying pain-relieving gel to my toes to be really effective too. I also found applying heat (using my Noozie - my electronic hot water bottle) very effective too. 2 weeks later and I was back at the hospital where they took my casts off so they could check everything was healing well - and although the wounds were still open there was no sign of infection. I was bowled over by how amazing my feet looked - I never dreamed that they could ever look that "normal". It is amazing that a surgeon can fix 10 years of problems in 5 hours! The surgeon managed to get my foot flat (something he doubted he'd be able to do) so he told the physio how the plan was to get back to standing up (something I hadn't done for years)! That is something I worked on since the casts were taken off about 4 weeks later. 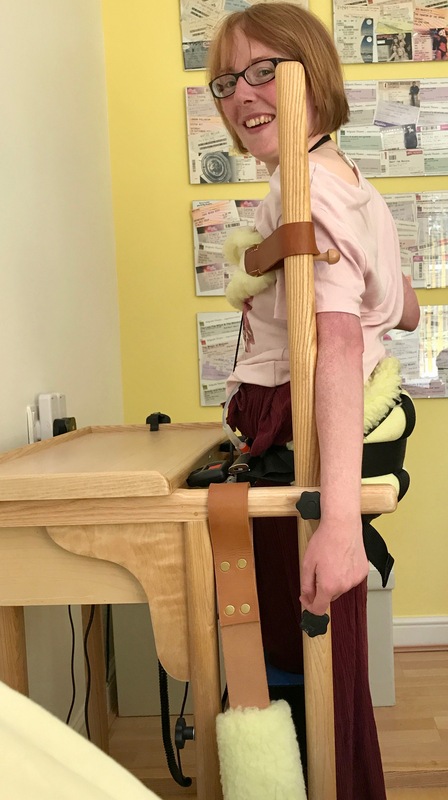 First I used a standing frame at physio every week whilst I built up strength in my legs using my exercise bike at home. 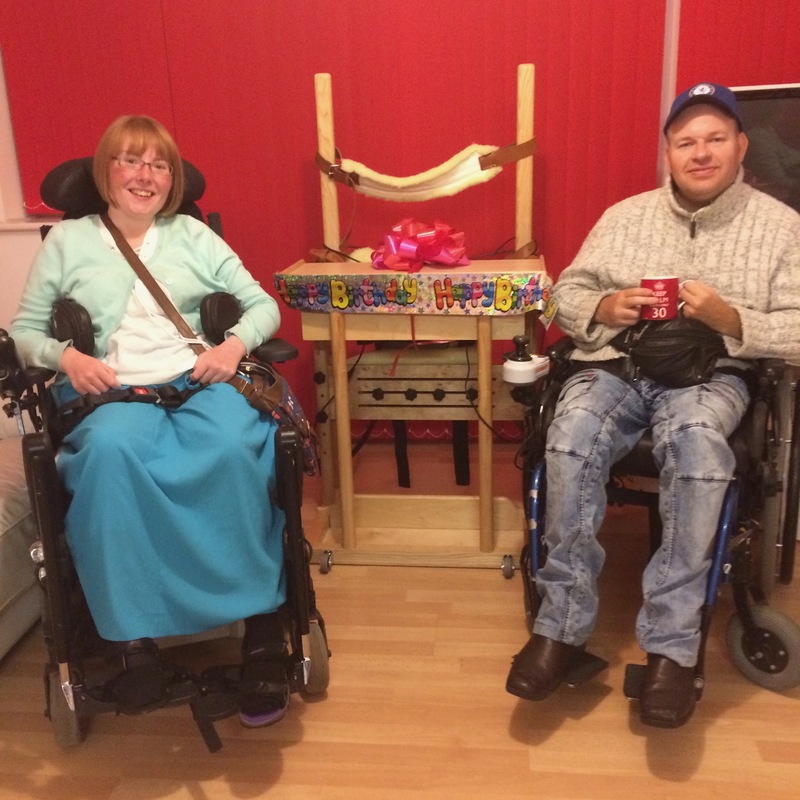 Then for my birthday last year my friend Matthew Law (who also has FA) overwhelmed me with his present - a standing frame! It took me a few months to find a PA to help me to use it, but I now stand for 30-45 minutes most days. I also stretch my tendons twice every day as advised by my physio and surgeon. I really hope standing and stretching will be enough to stop my tendons from becoming so tight again. I have always found finding shoes that fit difficult - both before the surgery and afterwards now I have to wear splints. I often used to the give up on shoes completele and go out wearing just socks. I had always heard about Cosyfeet but always assumed they were just for older people. However something made me look at their website and actually while some shoes are rather special, some are quite nice and they feel so comfortable and are so easy to get on that I wish I’d have given them a go years ago. They	have adjustable fastenings which make them a good option for people who have dexterity problems and allow the shoe to open up so my foot/splint can go right inside. 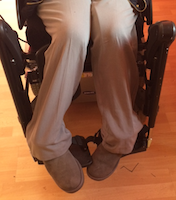 Cosyfeet shoes are extra wide which is needed for my splints to sit inside of them and flexible fabric ensure they do so comfortably. ost days.This website has been around sinse 1998, and although it's changed a lot over the years it's always been about me and my disability. Over the years I have used many different hosts and website design packages. For the past ten years or so I have used 1&1 as my host and I have always been very happy with it. I have always wanted to learn how to build a website from scratch using Adobe Dreamweaver, so about three years ago I got in touch with Polar Solutions and arranged for a trainer to come out to my home to teach me at my own pace. So I now design this website using Adobe Dreamweaver and the skills I learned on that course. I designed the buttons using Cool Text.